Password Authentication in Computer Science at Birkbeck was always very complicated for no reason. Over the years we had multiple passwords which always confused our students: YP & Active Directory, then NIS & AD, then LDAP with password Sync with AD, but with Solaris 11 & Solaris 10 I was finally in a position to get this sorted out. There is a lot of pages out there which help with this, but the best I found was http://www.seedsofgenius.net/solaris/solaris-authentication-login-with-active-directory (This link does not seem to work now, so here is a cached version: https://web.archive.org/web/20151101112540/www.seedsofgenius.net/solaris/solaris-authentication-login-with-active-directory) so please go ahead and follow this for more details. I have a cut down version here for Solaris 11. I will presume you have setup your Windows server (see link above Install UNIX Schema into Active Directory and Create ProxyDN User Account). svc:/network/dns/client> setprop config/domain = astring: "dcs.bbk.ac.uk"
svc:/network/dns/client> setprop config/search = astring: "dcs.bbk.ac.uk"
_ldap._tcp.dcs.bbk.ac.uk service = 0 100 389 dcsad02.dcs.bbk.ac.uk. _ldap._tcp.dcs.bbk.ac.uk service = 0 100 389 dcsad01.dcs.bbk.ac.uk. _gc._tcp.dcs.bbk.ac.uk service = 0 100 3268 dcsad02.dcs.bbk.ac.uk. _gc._tcp.dcs.bbk.ac.uk service = 0 100 3268 dcsad01.dcs.bbk.ac.uk. The follow shows what DNS servers you have registered. In our case it had more hosts (old hosts) than I expected, so I did some house keeping before continuing and deleted the old hosts. # Copyright (c) 2007, Oracle and/or its affiliates. All rights reserved. Test all has been successful by running the kinit command. After entering the Windows administrator password you should just get a prompt back. - Pay attention to the highlight parts which you will modify to point to the "full path of proxy user" and "proxy password", "domain name", "Top level search path", "IP of AD servers" and "domain name in service search description". So far so good but you need update /etc/nsswitch.conf. In my case I have ldap on passwd, groups and automoun. All other settings are put back to file. You can jump to Testing if you want check all has worked up to now. The final part is to alter PAM modules so that people can log into this system. Again, the changes to the default are highlighted. # Copyright (c) 1996, 2011, Oracle and/or its affiliates. All rights reserved. # bypass of construction requirements. # ldapsearch -h 193.61.1.1 -b "dc=dcs,dc=bbk,dc=ac,dc=uk" -D "cn=srv_ldapproxy,CN=Users,DC=dcs,DC=bbk,DC=ac,DC=uk" -w ClearTextPassword "samaccountname=andrew"
I am working on that blog next so should be avaialble next week. Thanks for this! This is great. I followed everything but I can't get getent password to show any ldap information but getent group will show ldap info. This is really great stuff.i followed and got every thing right except it logins in AD very late.is it normal? 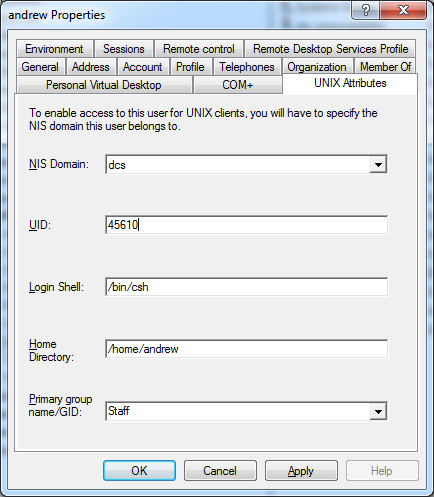 I would like to set it as an ldap client. and the svccfg commands and it works. But on every reboot all changes are lost. /etc/nsswich.conf is restored to its initial state. Damien, it looks like you are editing /etc/nsswich.conf manually. You have to update nsswich.conf using SMF. Search this blog entry for "Setup Name Service Switch Configuration" and use the svccfg command in the example. Thanks for your answer Andrew. svc:/system/name-service/switch> setprop config/password = "files ldap"
svc:/system/name-service/switch> setprop config/group = "files ldap"
svc:/system/name-service/switch> setprop config/host = "files [SUCCESS=return] dns"
svc:/system/name-service/switch> setprop config/network = "files"
svc:/system/name-service/switch> setprop config/protocol = "files"
svc:/system/name-service/switch> setprop config/rpc = "files"
svc:/system/name-service/switch> setprop config/ether = "files"
svc:/system/name-service/switch> setprop config/netmask = "files"
svc:/system/name-service/switch> setprop config/bootparam = "files"
svc:/system/name-service/switch> setprop config/publickey = "files"
svc:/system/name-service/switch> setprop config/alias = "files"
svc:/system/name-service/switch> setprop config/service = "files"
svc:/system/name-service/switch> setprop config/project = "files"
svc:/system/name-service/switch> setprop config/auth_attr = "files"
svc:/system/name-service/switch> setprop config/prof_attr = "files"
svc:/system/name-service/switch> setprop config/tnrhtp = "files"
svc:/system/name-service/switch> setprop config/tnrhdb = "files"
svc:/system/name-service/switch> setprop config/printer = "user files"
That is an intresting problem. I would post this to Oracle Solaris 11 Forum (https://forums.oracle.com/forums/forum.jspa?forumID=1321&start=0). Before that the only thing I can think of is that you have DHCP setup, which would reconfigire all network files on reboot? Yes, you think right Andrew! my solaris knowledge is limited. It doesn't seem such excentric configuration, is it? Damien, Solaris is getting better with it Administartion side, but it still is a pain. Possible solution "sudo sysconfig configure -s" Will reset you system so that when you reboot it will ask for hostname,networking, etc ref: Have a look at. http://www.oracle.com/technetwork/articles/servers-storage-admin/o11-111-s11-sysconfig-524498.html. If you do that then make a note of DNS (/etc/resolv.conf) and IP address before doing this. Andrew, I don't understand why you tell me to remember /etc/resolv.conf. I've done the "sysconfig configure -s"
no need for the resolv.conf. I can log again with an LDAP user. Once again it will be lost at next boot. Damien, I think I have a solution which I am working on. I am looking at http://www.oracle.com/technetwork/articles/servers-storage-dev/s11-network-config-1632927.html this page. 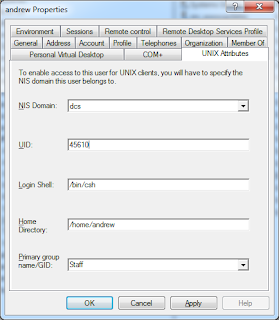 I am happy to take this off line so drop me an e-mail "andrew at DCS dot BBK dot AC dot UK"
Is there a way to limit the users that can log in by the group that they're in, using the PAM, ldapclient, or krb5 settings, WITHOUT having to create a separate sub dn? E.g., I have a set of web developers that are in the webdev group. Can you help me in getting any blog for integration solaris 11 with windows 2012 AD and I have to use NIS+. Has this guide changed at all for 11.2/11.3? New install and followed instructions exactly, but I am not able to authenticate. Ldap search commands return data correctly, however 'getent passwd username' doesn't return anything and ldaplist -l passwd returns ldaplist: LDAP error. Oddly enough just running getent passwd does dump all the users in AD which shows some of this is in fact working correctly. The only thing I potentially may have screwed up is the pam configs as they are now located in pam.d and have slight variations from the old values. Any ideas? I have got it working with Solaris 11.3 and I don't think there any changes. Hi - Can you please let me know what additional actions would be required , if you need to point to AD running 636 (secured) port. Do we need to import any certs ? i am trying to integrate active directory with solaris 11.3.
how can i get ProxyDN value ? what should ask from active directory team? The ProxyDN user is a normal user in AD. In my case the user is a member "Domain Users"